If you’ve used the Xamarin.Forms Frame element on iOS and have HasShadow set to true, then you might notice that on iOS, the shadow is quite abrasive and overwhelming. // no other code needs to go here unless you want more customizable properties. Xamarin.Tips – Create Your Own Star Wars Intro Text! The important part here is the RotationX value on the ScrollView. This is going to set the backwards tilt of the scroll. To break down the other parts that make this up – We have a static String resource to use as the text for the intro. In this case I’m using the crawl text from A New Hope. We also wrap the whole thing in a Grid so that we can set up the background Image element. Now we get a cool view that the user can scroll through at their own reading pace! Posted on March 27, 2017 Categories Android, C#, iOS, Mobile, Uncategorized, Xamarin, Xamarin.FormsTags C#, Mobile, UI, Xamarin, Xamarin.Forms, Xamarin.Tips1 Comment on Xamarin.Tips – Create Your Own Star Wars Intro Text! Here’s a quick freebie. If you want to change the color of your ListView Refreshing spinner, we can do that with a quick custom renderer! In previous posts, I talked about the misfortunes of the Xamarin.Forms TableView. In this post, we will look at changing the separator color with a custom renderer. For some other Xamarin.Tips on upgrading your TableView, check out these two posts on customizing the Section Titles! Now let’s take this view and create our renderers! Basically, we take the color and apply it as a ColorDrawable, including updating when the property changes from our Forms code. Similarly to our Android implementation, we set the SeparatorColor of our Native UITableView on set up and when the value changes. This is the Android counterpart! Let’s look at putting some shadows around a view with a fully transparent background. Android presented some completely different challenges compared to iOS. In the iOS solution, we ran into issues with Shadow layers requiring something in front of it to draw the drop shadow. With Android, using a CardView from the design support library gives us access to the Elevation and CardElevation properties which CAN indeed give us shadows around our view even though it is transparent. However, that kills any border on the view. Remember that we are looking for a transparent view, with a solid border, and shadows around it. The general approach for iOS was to draw two new layers with shadows around the right and bottom sides of the UIView. Using layers allowed us to draw outside the actual frame of the view. However, with iOS, we aren’t so lucky. Look at the Draw override. We are setting up 3 different paints. The first is the Paint for our white border. bottomPaint sets up for our bottom shadow using a LinearGradient as the shader, and similarly, rightPaint sets up our shadow for the right side. Finally, we call DrawRect for both our shadows, then our border. The values in the DrawRect calls for the shadows are just examples to play with padding and size values. You can play with those as you see fit to make your view look best. I’ve tested this in some large ListViews to test against the classic Android overdraw issue that can happen, but because it consists of 3 pretty simple strokes, I haven’t run into any performance issues. Hopefully this solution works for you! This is NOT a complete solution, or a real reusable control, but more of a general approach to rendering shadows around a control with a transparent background. 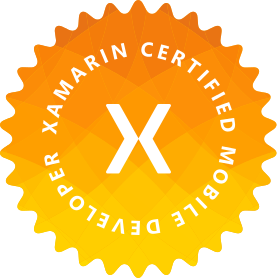 If you’re on my blog, you know I love Xamarin. Writing cross-platform applications and sharing as much code as possible is, in my opinion, the way to go. The Xamarin community has taken an awesome technology, and made it even more awesome by building tons and tons of plugins. These plugins allow us to access platform-specific functionality from shared code, which simply allows us as application developers to write even more code in our portable projects. I ran into an interesting forum post talking about the structure of plugins made a standard by Xamarin. A lot of use these plugins, but of course, they are not made for everyone! I’ve seen many repositories riddled with issues asking for more and more features in the plugin. This post is going to show some ways to expand on those features with your own code! As well as show techniques to use these plugins with Inversion of Control and Dependency Injection, rather than through the Singleton that the standard ships with. It might be a good idea to read up on my blogs and watch my videos about calling platform specific code from a PCL. Check out the YouTube playlist for some different techniques. Specifically looking at the Singleton method and Dependency Injection method. If you haven’t used it yet, it’s a cool plugin that allows you to call platform specific pop ups and dialogs including alerts, toasts, prompts, action sheets, confirmation messages, and more. We are also going to be using MvvmLight (as I tend to do) in order to use SimpleIoc for our Inversion of Control and Dependency Injection. Let’s first look at using IoC and DI, then look at extending the functionality. If we look at Singleton of UserDialogs, we see that it simply changes the Init method based on the platform, and uses that to set the platform-specific implementation of IUserDialogs. The core of the functionality comes from that implementation of IUserDialogs. So rather than going through the Init method of the Singleton, we can instead register the implementation to an IoC container, and inject it into the constructor of our ViewModel or Service that calls it! Now that our ViewModel has a reference to an IUserDialogs, we can make calls to it from ICommands or methods. Now all we need to do is register both our IUserDialogs platform implementation and our MyViewModelto our IoC container. // note iOS doesn't require registering lifecycle callbacks like iOS does. That’s all we need to do! As long as we make those Register calls for our MyViewModel and IUserDialogs before the call to the MyMainPage constructor, everything will be wired up and Injected. Now that we have our application using Dependency Injection instead of the Singleton, it makes it even easier to override and extend the functionality of the plugin. There are only two things we need to change to our implementation from above. Create a new platform implementation of IUserDialogs that inherits from the UserDialogsImpl. Change the IoC Registration to use our new implementation. Now where we registered the IUserDialogs before, we just substitute our new implementation! So now our IoC set up will automatically set up our new implementation, so when we call the Alert method, it will show the Tint color as Red. Create a new Interface that inherits IUserDialogs in our shared code. Now we can call our SayHello method from our ViewModel too! You don’t have to use Plugin Singletons! You can create new functionality through another interface and updated injections! As we develop our applications to be cross-platform, we try to share as much code between different platforms as possible. Many times, though, we have a need to call platform-specific code from that shared code; whether it be something such as playing a sound file, handling hardware readings, or using a third-party SDK that isn’t abstracted to be shareable. In these examples, we will look at implementing parts of the HockeyApp SDK that are specific to the platform you are running against such as showing the Feedback control to ask your users to report bugs or give feedback. There are a few ways to accomplish this, but in this post, we will look at using the Xamarin.Forms DependencyService. The Xamarin.Forms DependencyService allows us to register implementations in our platform code as the implementation of an interface defined in our shared code. We can then use the Get() method from the DependencyService to get a reference to the platform code in our shared code. Now in our platform projects, we will implement our IHockeyService. The important thing to note is the assembly level attribute tag we put over our namespace. This tag is what registers our implementation to the Dependency Service! Now we need to initialize the HockeyApp manager from our shared code. <Button Text="Get feedback with the dependency service!"